Recently I had the pleasure of listening to a lecture by Mr John Rubin, lead laryngeal surgeon at the Royal National Throat, Nose and Ear Hospital, University College, London. He focussed on the Voice – how it begins, how it develops and how we can keep it in tip-top condition as we age. For those of you in business, sole traders, managers or any role which includes oral communication, this should be of interest. Your voice presents your individuality and brand to the world. If you achieve the right subconscious influence, your message will be more engaging and have a more positive result. Basically, you will achieve more sales and profits and everyone wants that! So let’s look at how the voice changes when we reach adult life. The voice is at its peak in your 20’s. There is a general deterioration from 30’s which is significant by 50’s to 60’s. Capacity in lungs reduces by 40% between 20 and 80. Eventually some calcification of the ribcage cartilages makes it hard to expand the chest. The ageing of the larynx can produce a sense of fragility as it thins after 40. The reduced ability to close the vocal cords can cause breathiness. Due to less elasticity you may hear a tenser sound or tremors. As vocal cords stiffen (age 60+) the male pitch rises. A roughness, huskiness may result. Hormones greatly affect a woman’s voice. 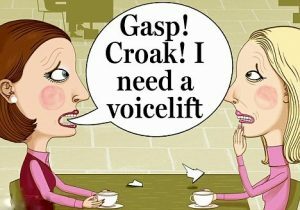 HRT can make the voice sound ‘younger’. Remember that the content in your business message may be important but the way you SOUND will be having an equally important effect on the listener. 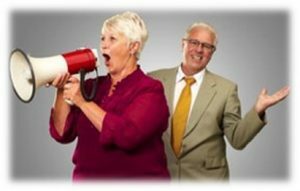 And if you are still running your company in your 80’s and your voice is losing it’s power, the latest innovation in cosmetic surgery is The Voice Lift – I kid you not!